دهقان منشادی, سید هادی, میرزائی, نوربخش, اسکندری قادی, مرتضی, شعبانی, الهام. (1396). بررسی کاربرد آهنگ لغزش گسل‏ها در پهنه‏بندی مستقل از زمان خطر زمین‏لرزه در منطقه کرمان-غرب بلوک لوت. مجله ژئوفیزیک ایران, 11(2), 36-62. سید هادی دهقان منشادی; نوربخش میرزائی; مرتضی اسکندری قادی; الهام شعبانی. "بررسی کاربرد آهنگ لغزش گسل‏ها در پهنه‏بندی مستقل از زمان خطر زمین‏لرزه در منطقه کرمان-غرب بلوک لوت". مجله ژئوفیزیک ایران, 11, 2, 1396, 36-62. دهقان منشادی, سید هادی, میرزائی, نوربخش, اسکندری قادی, مرتضی, شعبانی, الهام. (1396). 'بررسی کاربرد آهنگ لغزش گسل‏ها در پهنه‏بندی مستقل از زمان خطر زمین‏لرزه در منطقه کرمان-غرب بلوک لوت', مجله ژئوفیزیک ایران, 11(2), pp. 36-62. دهقان منشادی, سید هادی, میرزائی, نوربخش, اسکندری قادی, مرتضی, شعبانی, الهام. بررسی کاربرد آهنگ لغزش گسل‏ها در پهنه‏بندی مستقل از زمان خطر زمین‏لرزه در منطقه کرمان-غرب بلوک لوت. مجله ژئوفیزیک ایران, 1396; 11(2): 36-62. در این مطالعه، برای اولین بار با استفادۀ مستقیم و غیرمستقیم از آهنگ لغزش (slip rate) پهنه‎بندی مستقل از زمان خطر زمین‏لرزه برای نواحی‎ای از جنوب شرق ایران انجام گرفته و شتاب طیفی برای دو شهر کرمان و راور در استان کرمان برآورد شده است.آهنگ لغزش گسل‏ها به طور غیرمستقیم در محاسبۀ متوسط آهنگ رویداد سالانۀ چشمه‏ها (λ)، با استفاده از تابع توزیع مکانی‏ دخالت داده شده ‏است. همچنین، متوسط آهنگ رویداد سالانۀ چشمه‏ها مستقیماً از آهنگ لغزش نسبت داده‌شده به هر چشمه محاسبه شده است. به منظور بررسی تأثیر مشارکت آهنگ لغزش گسل‎های منطقه بر روی نتایج برآورد احتمالاتی خطر زمین‏لرزه، نتایج حاصل از پهنه‏بندی مستقل از زمان خطر زمین‎لرزه در کل گسترۀ مورد مطالعه برای سه حالت: 1- عدم استفاده از آهنگ لغزش، 2- استفادۀ غیرمستقیم از آهنگ لغزش و 3- استفادۀ مستقیم از آهنگ لغزش، برای سطح خطر 10 درصد احتمال فزونی در 50 سال (دورۀ بازگشت 475 سال) مقایسه گردیده است. مقایسۀ حالت‌های 1 و 2 نشان‌دهندۀ تغییرات بین g02/0-0 و مقایسۀ حالت‌های 1 و 3 نشان‌دهندۀ تغییرات g11/0-0 در نقاط مختلف گسترۀ مورد مطالعه است. در صورت استفادۀ مستقیم از آهنگ لغزش (حالت 3)، برای بیش از 98 درصد از مساحت گسترۀ مورد مطالعه، تغییرات بیشینه شتاب جنبش زمین (PGA) در مقایسه با حالت عدم استفاده از آهنگ لغزش (حالت 1) کمتر از 26درصد و برای بیش از نیمی از گستره، کمتر از 10درصد است. مقادیر بیشینه شتاب طیفی در شهر کرمان برای سه حالت ذکرشده به ترتیب g61/0، g61/0 و g57/0 و در شهر راور به ترتیب g71/0، g67/0 و g6/0 در پریود 15/0 ثانیه به دست آمده است. همچنین، مقدار PGAبرای این سه حالت در شهر کرمان به ترتیب g25/0، g25/0 و g23/0 و در شهر راور به ترتیب g29/0، g27/0 و g24/0 برآورد شده است. نتایج این تحقیق نشان می‏دهد با توجه به کمبود داده‏های زمین‏لرزه‎ای در بسیاری از نقاط ایران، می‏توان از آهنگ لغزش به‌صورت مستقیم یا غیرمستقیم به‌عنوان دادۀ منحصربه‌فرد هر چشمه در پهنه‌بندی مستقل از زمان خطر زمین‌لرزه استفاده کرد. در این مطالعه، محاسبات برای خاک نوع یک (سنگ بستر)، مطابق با آیین‏نامۀ 2800 ایران انجام گرفته است. Presently, seismic hazard assessment (SHA) is highly conducive to seismic-resistant building designs and seismic regulations. Seismic hazard maps and other seismic hazard products such as spectral acceleration (SA) are prerequisites for the preparation of building codes and earthquake risk mitigation plans, which are used in making public decisions and policy. Therefore, it is indispensable to use the best available data and methods in SHA. In cases of incomplete historical records like Iran, and in intracontinental areas like Central-East Iran, where fracture boundaries interact slowly, large earthquakes may recur every 1000–5000 years or even with a longer period. In such areas, it is useful to employ geological inputs like slip rates. In the present paper, the slip rate of the faults is used for the first time, in both direct and indirect approaches in time-independent probabilistic seismic hazard assessment (PSHA), so as to evaluate spectral acceleration (SA). To this end, Kerman region (Southeastern Iran) is selected as an example, and Kerman and Ravar cities located between 54-59° N, and 28.5- 34° E are considered as specific regions to show the effects of slip rate on the seismic hazard. With the purpose of using slip rates in PSHA, indirectly, we have defined a new factor denoted as the fifth factor (K5) to specify the effects of slip rates in calculating spatial distribution function (SDF). On the other hand, the mean annual occurrence rate of each source may be directly calculated based on the slip rate of the faults for a direct use of slip rates in PSHA. In the first time-consuming stage, the slip rates of the faults or fault segments and the seismological data are assembled using available resources and literature. Seismicity parameters in the targeted region are calculated using a unified, homogenized and complete catalog in the method proposed by Kijko and Sellevoll (1992), in which one can consider the magnitude uncertainty and completeness of data in calculations. Through the use of geological maps with scales of 1:100000 and 1:250000, and with the experience of previous studies, we have determined 26 potential seismic sources in the region. The comparison of the SDFs calculated based on four factors (K1-K4) and SDFs calculated based on slip rate factor (the fifth, K5) accompanied with the previous four factors indicates that the most differences occurred for sources No. 111 and 121 for the magnitude of 7<Mw≤7.5. On the other hand, the maximum total differences in all magnitude intervals occurred in sources No. 111, 249 and 248. The macrozonation time-independent PSHA maps of the region of interest for 10% probability of exceedance in 50 years (return period of 475 years) have been produced under three main states, which are State 1: without considering the effects of slip rate, State 2: with indirectly considering the effects of slip rate, and State 3: with directly considering the contribution of slip rate. After comparing States 2 and 3 with the State 1, the differences between 0-0.02g and 0-0.11g became clear. With directly considering the effects of slip rate in calculations, more than 98% of the interest region have differences less than 26%, and more than half of the interest region have differences less than 10% and the most difference between States 1 and 2 is approximately 10%. The numerical evaluation of spectral accelerations for 10% probability of exceedance in 50 years based on these three different states in Kerman results in the peak ground accelerations (PGA) of 0.25g, 0.25g and 0.23g, for the States 1, 2 and 3, respectively. In the same way, the values of PGA for Ravar have been determined as 0.29g, 0.27g and 0.24g for different three states. The maximum SA for these two cities have been achieved at 0.15 seconds, and its values are respectively 0.61g, 0.61g and 0.57g for States 1, 2 and 3 in Kerman and 0.71g, 0.68g and 0.60g in Ravar. As far as SA, no significant difference has been observed between States 1 and 2 (Kerman); a slight difference, on the other hand, has been observed between States 1 and 3. These differences are more prominent as far as Ravar region is concerned. Findings indicate that there exists a satisfactory proximity between the three states. Due to the lack of sufficient seismological data in most parts of Iran and considering the relative merits of the direct slip rate approach, we used this method as an exclusive alternative data from each source; where the results are acceptable and thus slip rate method is recommended for further research. In this study, all calculations have been carried out on bed rock. دهقان منشادی، س. ه.، میرزائی، ن.، اسکندری قادی، م.، 1394، برآورد شتاب طیفی در منطقه اصفهان و مقایسه نتایج با شتاب طیفی آیین‌نامه 2800 ایران و آیین‏نامه IBC آمریکا، مجله ژئوفیزیک ایران، 9(1)، 119-100. شاه‏پسندزاده، م.، نوگل سادات، م. ع. ا.، آفتابی، ع.، 1382، تحلیل ساختاری و جنبشی پهنه‏های گسل پشت‏بادام، چاپدونی و چاتک-نی‏باز در باختر ریز صفحه ایران مرکزی، فصلنامه علوم زمین، 48-47، 77-68. شبان، م.، قائمی، ف.، عباس‏نژاد، ا.، قائمی، ف.، 1393، بررسی میزان جنبایی ‏زمین‌ساختی در گستره بهاباد (شمال خاور استان یزد) با استفاده از شاخص‏های ریخت‏زمین‌ساختی، فصلنامه علوم زمین، 91، 152-141. شفیعی بافتی، ا.، شاه‏پسندزاده، م.، 1389، بررسی ریخت‏زمینساخت و لرزه‏زمینساخت پهنه گسلی راور، جنوب ایران مرکزی، فصلنامه علوم زمین، 75، 66-57. طالبیان، م.، هاشمی طباطبایی، س.، فتاحی، م.، قرشی، م.، بیت‏اللهی، ع.، قلندرزاده، ع.، ریاحی، م. ع.، 1388، برآورد نرخ لغزش گسل‏های پیرامون بم و کاربرد آن در ارزیابی خطر زمین‏لرزه، فصلنامه علوم زمین، 74، 156-149. قدرتی امیری، غ.، رضویان امرئی، س. ع.، طهماسبی بروجنی، م. ع.، 1394، تحلیل حطر لرزه‏ای و تهیه طیف خطر یکسان برای مناطق مختلف شهر کرمان، نشریه علمی-پژوهشی مهندسی سازه و ساخت، 2، 51-43. موسوی بفروئی، س. ح.، میرزائی، ن.، شعبانی، ا.، اسکندری قادی، م.، 1393، پهنه‏بندی خطر زمین‏لرزه در ایران و برآورد مقادیر بیشینه شتاب برای مراکز استان‏ها، مجله فیزیک زمین و فضا، 40(4)، 38-15. Aki, K., and Richards, P. G., 1980, Quantitative seismology: theory and methods, W. H. Freeman, San Francisco. Akinci, A., Galadini, F., Pantosti, D., Petersen, M., Malagnini, L., and Perkins, D., 2009, Effect of time dependence on probabilistic seismic-hazard maps and deaggregation for the central Apennines, Italy: Bulletin of the Seismological Society of America, 99(2A), 585-610. Allen, M. B., Kheirkhah, M., Emami, M. H., and Jones, S. J., 2011, Right-lateral shear across Iran and kinematic change in the Arabia-Eurasia collision zone: Geophysical Journal International, 184(2), 555-574. Ambraseys, N., and Melville, C., 1982, A History of Persian Earthquakes Cambridge Univiversity Press, New York. Ambraseys, N. N., 2001, Reassessment of earthquakes, 1900–1999, in the Eastern Mediterranean and the Middle East: Geophysical Journal International, 145(2), 471-485. Anderson, J. G., Wesnousky, S. G., and Stirling, M. W., 1996, Earthquake size as a function of fault slip rate: Bulletin of the Seismological Society of America, 86(3), 683-690. Baker, C., 1993, The active seismicity and tectonics of Iran: Ph. D. Thesis, University of Cambridge, UK. Bayer, R., Shabanian, E., Regard, V., Yaminifard, F., Vernant, P., Nilforoushan, F., Abbassi, M., Chery, J., Tatar, M., and Doerflinger, E., 2002, Active deformation in the Zagros-Makran Transition Zone inferred from GPS, Tectonic and Seismological measurements: paper presented at Eos Trans, AGU Fall Meeting Abstracts. Berberian, M., 1976, Quaternary faults in Iran. In: Berberian, M. (Ed. ), Contribution to the Seismotectonics of Iran, (Part II): Geol. Surv. Iran, 39, 187-258. Berberian, M., 2005, The 2003 Bam Urban Earthquake: A Predictable Seismotectonic Pattern Along the Western Margin of the Rigid Lut Block, Southeast Iran: Earthquake Spectra, 21(S1), 35-99. Berberian, M., and Yeats, R. S., 1999, Patterns of Historical Earthquake Rupture in the Iranian Plateau: Bulletin of the Seismological Society of America, 89(1), 120-139. Berberian, M., and Yeats, R. S., 2001, Contribution of archaeological data to studies of earthquake history in the Iranian Plateau: Journal of Structural Geology, 23(2-3), 563-584. Berberian, M., Asudeh, I., and Arshadi, S., 1979, Surface rupture and mechanism of the Bob-Tangol (southeastern Iran) earthquake of 19 December 1977: Earth and Planetary Science Letters, 42(3), 456-462. Berberian, M., Jackson, J. A., Fielding, E., Parsons, B. E., Priestley, K., Qorashi, M., Talebian, M., Walker, R., Wright, T. J., and Baker, C., 2001, The 1998 March 14 Fandoqa earthquake (Mw 6.6) in Kerman province, southeast Iran: re-rupture of the 1981 Sirch earthquake fault, triggering of slip on adjacent thrusts and the active tectonics of the Gowk fault zone: Geophysical Journal International, 146(2), 371-398. Boore, D. M., and Atkinson, G. M., 2008, Ground-motion prediction equations for the average horizontal component of PGA, PGV, and 5%-damped PSA at spectral periods between 0.01 s and 10.0 s: Earthquake Spectra, 24(1), 99-138. Campbell, K. W., and Bozorgnia, Y., 2008, NGA ground motion model for the geometric mean horizontal component of PGA, PGV, PGD and 5% damped linear elastic response spectra for periods ranging from 0.01 to 10 s: Earthquake Spectra, 24(1), 139-171. Chiou, B. S. J., and Youngs, R. R., 2008, An NGA model for the average horizontal component of peak ground motion and response spectra: Earthquake Spectra, 24(1), 173-215. EZ-FRISK, 2011, User’s Manual, version 7.6, Risk Engineering Inc., Boulder, Colorado. Farzampour, A. R., and Kamali-Asl, A., 2015, Seismic hazard assessment for two cities in Eastern Iran: Earthquakes and Structures, 8(3), 681-697. Fattahi, M., Walker, R. T., Talebian, M., Sloan, R. A., and Rasheedi, A., 2011, The structure and late Quaternary slip rate of the Rafsanjan strike-slip fault, SE Iran: Geosphere, 7(5), 1159-1174. Fattahi, M., Walker, R. T., Talebian, M., Sloan, R. A., and Rasheedi, A., 2014, Late Quaternary active faulting and landscape evolution in relation to the Gowk Fault in the South Golbaf Basin, S.E. Iran: Geomorphology, 204, 334-343. Field, E. H., Jackson, D. D., and Dolan, J. F., 1999, A mutually consistent seismic-hazard source model for Southern California: Bulletin of the Seismological Society of America, 89(3), 559-578. Foroutan, M., Sébrier, M., Nazari, H., Meyer, B., Fattahi, M., Rashidi, A., Le Dortz, K., and Bateman, M. D., 2012, New evidence for large earthquakes on the Central Iran plateau: palaeoseismology of the Anar fault: Geophysical Journal International, 189(1), 6-18. Foroutan, M., Meyer, B., Sébrier, M., Nazari, H., Murray, A. S., Le Dortz, K., Shokri, M. A., Arnold, M., Aumaître, G., Bourlès, D., Keddadouche, K., Solaymani Azad, S., and Bolourchi, M. J., 2014, Late Pleistocene-Holocene right slip rate and paleoseismology of the Nayband fault, western margin of the Lut block, Iran: Journal of Geophysical Research: Solid Earth, 119(4), 3517-3560. Gao, M., 1988, Discussion on annual occurrence rates: Developments in World Seismology, 1, 1-5. Ghodrati Amiri, G., Mahdavian, A., and Manouchehri Dana, F., 2007, Attenuation relationships for Iran: Journal of Earthquake Engineering, 11(4), 469-492. Ghodrati Amiri, G., Khorasani, M., Mirza Hessabi, M., and Razavian Amrei, S. A., 2010, Ground motion prediction equations of spectral ordinates and Arias intensity for Iran: Journal of Earthquake Engineering, 14, 1-29. GSI 1992a, Geological Quadrangle Map of Iran (Sabzevaran sheet), scale 1:250000, Geological Survey of Iran, Tehran, Iran. GSI 1992b, Geological Quadrangle Map of Iran I40 (Rafsanjan sheet), scale 1:250000, Geological Survey of Iran, Tehran, Iran. GSI 1996, Geological Quadrangle Map of Iran NH. 40.2 (Ravar sheet), scale 1:250000, Geological Survey of Iran, Tehran, Iran. GSI 1999, Geological map of Iran, Bahabad sheet-7253, scale 1: 100,000, Geological Survey of Iran, Tehran, Iran. Hanks, T. C., and Kanamori, H., 1979, A moment magnitude scale: Journal of Geophysical Research B: Solid Earth, 84(B5), 2348-2350. Jackson, J., Bouchon, M., Fielding, E., Funning, G., Ghorashi, M., Hatzfeld, D., Nazari, H., Parsons, B., Priestley, K., Talebian, M., Tatar, M., Walker, R., and Wright, T., 2006, Seismotectonic, rupture process, and earthquake-hazard aspects of the 2003 December 26 Bam, Iran, earthquake: Geophysical Journal International, 166(3), 1270-1292. Kagan, Y. Y., and Jackson, D. D., 1994, Long-term probabilistic forecasting of earthquakes: Journal of Geophysical Research, 99(B7), 13,685-613,700. Keller, E. A., and Pinter, N., 1996, Active Tectonics: Earthquakes, Uplift, and Landscape, Prentice Hall, New Jersey. Khodaverdian, A., Zafarani, H., and Rahimian, M., 2015, Long term fault slip rates, distributed deformation rates and forecast of seismicity in the Iranian Plateau: Tectonics, 34(10), 2190-2220. Kijko, A., and Sellevoll, M. A., 1989, Estimation of earthquake hazard parameters from incomplete data files. Part I. Utilization of extreme and complete catalogs with different threshold magnitudes: Bulletin of the Seismological Society of America, 79(3), 645-654. Kijko, A., and Sellevoll, M. A., 1992, Estimation of earthquake hazard parameters from incomplete data files: part II. Incorporation of magnitude heterogeneity: Bulletin of the Seismological Society of America, 82(1), 120-134. Le Dortz, K., Meyer, B., Sébrier, M., Nazari, H., Braucher, R., Fattahi, M., Benedetti, L., Foroutan, M., Siame, L., Bourlès, D., Talebian, M., Bateman, M. D., and Ghoraishi, M., 2009, Holocene right-slip rate determined by cosmogenic and OSL dating on the Anar fault, Central Iran: Geophysical Journal International, 179(2), 700-710. Lee, C. F., Ye, H., and Zhou, Q., 1997, On the potential seismic hazard in Hong Kong: in Episodes 20 (2), 89-94. McGuire, R. K., 1995, Probabilistic seismic hazard analysis and design earthquakes: closing the loop: Bulletin of the Seismological Society of America, 85(5), 1275-1284. McGuire, R. K., 2004, Seismic Hazard and Risk Analysis, edited, p. 221, EERI Monograph MNO-10, Earthquake Engineering Research Institute, Oakland, California. McGuire, R. K., 2008, Probabilistic seismic hazard analysis: Early history: Earthquake Engineering and Structural Dynamics, 37(3), 329-338. Mirzaei, N., 1997, Seismic Zoning of Iran: Ph.D. dissertation in Geophysics, Institute of Geophysics, State Seismological Bureau, Beijng, People’s Republic of China, 134pp. Mirzaei, N., Gao, M., and Chen, Y. T., 1998, Seismic source regionalization for seismic zoning of Iran: Major seismotectonic provinces: Journal of Earthquake Prediction Research, 7, 465-495. Mirzaei, N., Gao, M., and Chen, Y. T., 1999, Delineation of potential seismic sources for seismic zoning of Iran: Journal of Seismology, 3(1), 17-30. Mousavi-Bafrouei, S. H., Mirzaei, N., and Shabani, E., 2014, A declustered earthquake catalog for the Iranian Plateau: Annals of Geophysics, 57(6), S0653. Pace, B., Peruzza, L., Lavecchia, G., and Boncio, P., 2006, Layered seismogenic source model and probabilistic seismic-hazard analyses in central Italy: Bulletin of the Seismological Society of America, 96(1), 107-132. Regard, V., Bellier, O., Thomas, J.-C., Abbassi, M. R., Mercier, J., Shabanian, E., Feghhi, K., and Soleymani, S., 2004, Accommodation of Arabia-Eurasia convergence in the Zagros-Makran transfer zone, SE Iran: A transition between collision and subduction through a young deforming system: Tectonics, 23, TC 4007. Regard, V., Bellier, O., Thomas, J.-C., Bourlès, D., Bonnet, S., Abbassi, M. R., Braucher, R., Mercier, J., Shabanian, E., Soleymani, S., and Feghhi, K., 2005, Cumulative right-lateral fault slip rate across the Zagros–Makran transfer zone: role of the Minab–Zendan fault system in accommodating Arabia–Eurasia convergence in southeast Iran: Geophysical Journal International, 162, 177-203. Reid, H. F., 1910, The Mechanics of the Earthquake, The California Earthquake of April 18, 1906: Report of the State Earthquake Investigation CommissionVol. 2, Carnegie Institution of Washington Publication 87, Washington, DC. Reiter, L., 1990, Earthquake Hazard Analysis: Issues and Insights, Columbia University Press, New York, 254 pp. Shabani, E., and Mirzaei, N., 2007, Probabilistic seismic hazard assesment of the Kermanshah-Sanandaj region of western Iran: Earthquake Spectra, 23(1), 175-197. Shi, Z., and Zhang, T., 1996, Seismic intensity zoning map of China, In: Achievements of seismic hazard prevention and reduction in China, Seismological Press, Beijing, PP. 143-164. Shi, Z., Yan, J., and Gao, M., 1992, Research on the principle and methodology of seismic zonation—Results of the trials in North China: Acta Seismologica Sinica, 5(2), 305-314. Shoja-Taheri, J., Naserieh, S., and Hadi, G., 2010, A test of the applicability of NGA models to the strong ground-motion data in the Iranian plateau: Journal of Earthquake Engineering, 14(2), 278-292. Storchak, D. A., Di Giacomo, D., Engdahl, E. R., Harris, J., Bondár, I., Lee, W. H. K., Bormann, P., and Villaseñor, A., 2015, The ISC-GEM Global Instrumental Earthquake Catalogue (1900–2009): Introduction: Physics of the Earth and Planetary Interiors, 239(0), 48-63. Talebian, M., Biggs, J., Bolourchi, M., Copley, A., Ghassemi, A., Ghorashi, M., Hollingsworth, J., Jackson, J., Nissen, E., Oveisi, B., Parsons, B., Priestley, K., and Saiidi, A., 2006, The Dahuiyeh (Zarand) earthquake of 2005 February 22 in central Iran: reactivation of an intramountain reverse fault: Geophysical Journal International, 164(1), 137-148. Vernant, P., Nilforoushan, F., Hatzfeld, D., Abbassi, M. R., Vigny, C., Masson, F., Nankali, H., Martinod, J., Ashtiani, A., Bayer, R., Tavakoli, F., and Chéry, J., 2004, Present-day crustal deformation and plate kinematics in the Middle East constrained by GPS measurements in Iran and northern Oman: Geophysical Journal International, 157(1), 381-398. Walker, F., and Allen, M. B., 2012, Offset rivers, drainage spacing and the record of strike-slip faulting: The Kuh Banan Fault, Iran: Tectonophysics, 530–531(0), 251-263. Walker, R., Jackson, J., and Baker, C., 2003, Surface expression of thrust faulting in eastern Iran: source parameters and surface deformation of the 1978 Tabas and 1968 Ferdows earthquake sequences: Geophysical Journal International, 152(3), 749-765. Walker, R. T., 2006, A remote sensing study of active folding and faulting in southern Kerman province, S.E. 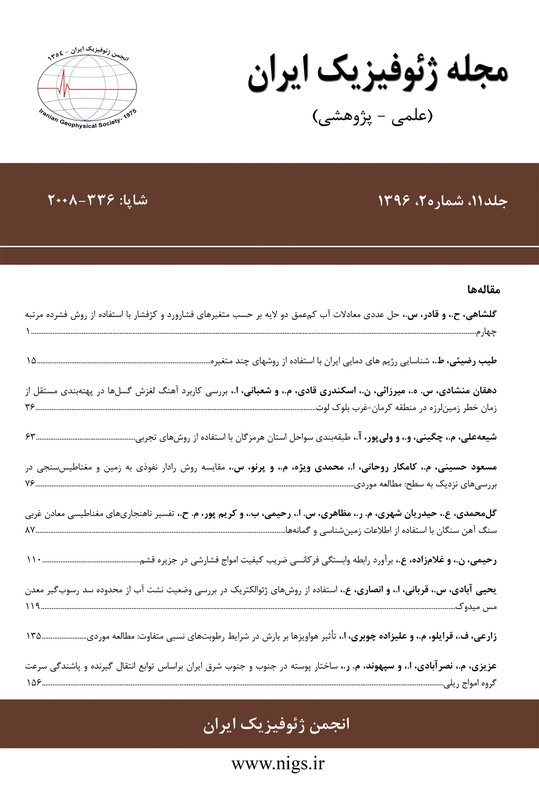 Iran: Journal of Structural Geology, 28(4), 654-668. Walker, R. T., and Jackson, J., 2002, Offset and evolution of the Gowk fault, S.E. Iran: a major intra-continental strike-slip system: Journal of Structural Geology, 24(11), 1677-1698. Walker, R. T., and Jackson, J., 2004, Active tectonics and late Cenozoic strain distribution in central and eastern Iran: Tectonics, 23(5), TC5010 5011-5024. Walker, R. T., Talebian, M., Saiffori, S., Sloan, R. A., Rasheedi, A., MacBean, N., and Ghassemi, A., 2010, Active faulting, earthquakes, and restraining bend development near Kerman city in southeastern Iran: Journal of Structural Geology, 32(8), 1046-1060. Walker, R. T., Gans, P., Allen, M. B., Jackson, J., Khatib, M., Marsh, N., and Zarrinkoub, M., 2009, Late Cenozoic volcanism and rates of active faulting in eastern Iran: Geophysical Journal International, 177(2), 783-805. Wells, D. L., and Coppersmith, K. J., 1994, New empirical relationships among magnitude, rupture length, rupture width, rupture area, and surface displacement: Bulletin of the Seismological Society of America, 84(4), 974-1002. WGCEP, 1995, Seismic hazards in southern California: probable earthquakes, 1994 to 2024: Bulletin of the Seismological Society of America, 85(2), 379-439. WGCEP, 1999, Earthquake probabilities in the San Francisco Bay Region: 2000-2030 - A summary of findings: U.S. Geological Survey Open-File Rpt. 99-517, 36p. WGCEP, 2003, Earthquake probabilities in the San Francisco Bay region: 2002-2031: U.S. Geol. Surv. Open-File Rept. 03-214. WGCEP, 2007, The uniform California earthquake rupture forecast, version 2 (UCERF2): USGS Open File Report, 1437. Yan, J., 1993, Principals and methods to determine spatial distribution function: Proceedings, PRC/USSR Workshop on Geodynamics and Seismic Risk Assessment, 159-167. Youngs, R. R., and Coppersmith, K. J., 1985, Implications of fault slip rates and earthquake recurrence models to probabilistic seismic hazard estimates: Bulletin of the Seismological Society of America, 75(4), 939-964. Zafarani, H., and Soghrat, M., 2012, Simulation of ground motion in the Zagros region of Iran using the specific barrier model and the stochastic method: Bulletin of the Seismological Society of America, 102(5), 2031-2045. Zafarani, H., Mousavi, M., Noorzad, A. S., and Ansari, A., 2008, Calibration of the specific barrier model to Iranian plateau earthquakes and development of physically based attenuation relationships for Iran: Soil Dynamics and Earthquake Engineering, 28, 550-576.